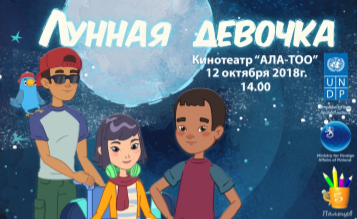 The premiere of the animation film “The Moon Girl” will take place on 12 October 2018 at 14.00 in cinema Ala-Too. The film created in Kyrgyz and Russian languages with English subtitles. Russian version will be shown in a large hall, Kyrgyz version of the film will be shown in a small hall. The duration of the film is 1 hour. “The Moon Girl” created with the aim to promote implementation of people with disabilities’ rights and freedoms. It raises the issues on necessity of providing accessible economic, social, cultural environment, health care, educational, informational and communicational system that will enable persons with disabilities to enjoy all human rights. In the film, the fate of migrants’ children is also reflected along with the problems of persons with disabilities. The main idea of ​​the film is to improve legal culture of population, calls citizens for tolerance, kindness, observance of laws, respect the rights of others. In addition, the film encourages audience to be optimistic, to fight for rights and for a good cause, inspires faith and hope for the good future. The animation film produced within the framework of implementation project’s main goals on widening access to the justice for vulnerable groups, on promoting the UN Convention on the Rights of Persons with Disabilities in the Kyrgyz Republic, on implementation the “Concept on Raising the Legal Culture of the Population of the Kyrgyz Republic for 2016-2020”. The UN Convention on the Rights of Persons with Disabilities states that persons with disabilities have all human rights and it is necessary to create conditions so that they can move independently, work, study, get medical and other services, discover themselves and be useful for the society.